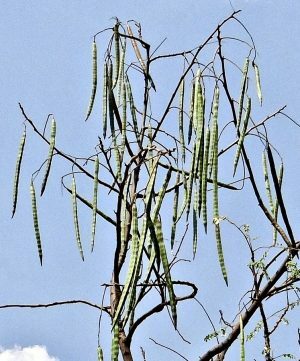 The horseradish tree has other names - moringa, the drumstick tree or the benzoil tree. It scientific name is Moringa oleifera. 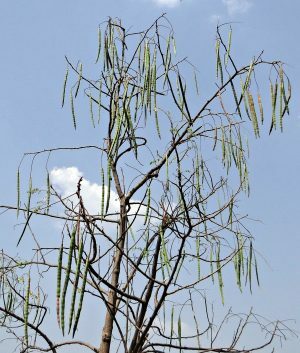 The word moringa is derived from a Tamil word, murungai - which means twisted pod, referring to the shape of the tree’s young fruit. It is native to the foothills of the Himalayas. It is known to have been cultivated for some 3000 years (source : Mabberley’s Plant Book) and it is a very ‘versatile’ plant as nearly every part of the tree can be used. It can thrive in semi-arid conditions. 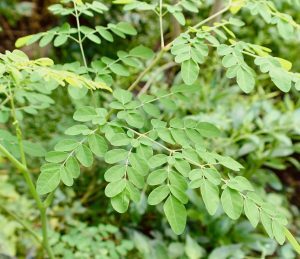 Moringa is grown in India, Thailand, the Philippines, parts of the Caribbean and Indonesia. Its seeds yield oil (Ben Oil - which can be 40% of the seeds‘ weight); this oil can be used as a salad oil, in artists’ paints, for oiling machinery, in soap manufacture and formerly for the embalming of mummies. The leaves and seed pods are used in cooking and are rich in vitamin C, calcium and potassium. The pods, roots and bark smell of horseradish - hence one of its names. The wood of the tree can be pulped - for the production of cellophane and rayon, or it can be used as a fuel. The roots can be shredded and used as a condiment, with a sharp flavour due to the presence of polyphenols. After the oil has been extracted from the seeds, a ‘seed cake’ is left; which can be used as a fertiliser. It has also been used to effect a rudimentary clean of ‘dirty” water (water that has organic material).` The seed cake contains charged proteins which ‘pick up’ the organic material in the water. However, whilst such a ‘clean’ removes a lot of material it leaves enough for bacteria to regrow after a day or so - leaving only a ‘brief window’ in which the water is ‘drinkable’. However, scientists at Carnegie Mellon and Penn State University have been investigating how to improve the cleaning capacity of this material. Stephanie Velegol suggested combining this method of purification with sand filtration - a common procedure in developing countries. So, the research team extracted the proteins from the seeds and stuck them onto to silica particles (silica is the major component of sand); this is called F-sand. It was found to reduce turbidity, stick to organic material and remove micro-organisms. Further work on F-sand was done by Tilton and Przybycien. It was first thought that purification and isolation of particular proteins in the seed cake might improve the efficiency of the process, but this was not the case. Then, they looked at removing the fatty acids from the seed cake. This too made no difference to the efficiency of the process. The fact that the seed cake (with the sand) does not need special treatment is ‘good news’ as resources for such processes are often scarce in poorer countries; it seems it is a process that with further development might offer a cheap and flexible method of water treatment.